Founder and CEO, Joe Ehrhardt presented last week at the ICBA ThinkTECH Demo Day hosted by the Arkansas Regional Innovation Hub. Also presenting were cohorts Adlumin, Agora, Botdoc, CRiskCo, KapitalWise, MK Decision, and Sou Sou. It was been an amazing 12-week experience for everyone here at Teslar. 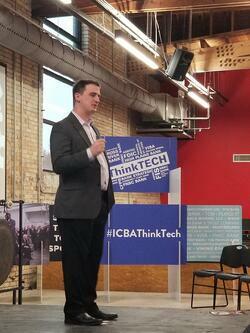 Thank you to the ICBA and The Venture Center for selecting us to be a participant in the inaugural class. We come out of the program even more excited to continue empowering community banks.